(Note: this is a paper I delivered in July 2011 at the Comic Art Conference, the annual academic meeting of comics scholars held in conjunction with the San Diego Comic-Con, in a session organized by Matt Smith and Randy Duncan. I've been meaning for a while to expand it and publish it, but as 2012 turns into 2013, I'm realizing that I've sat on these ideas for long enough and that I should get them out there sooner rather than later; so I will post it here for now as delivered, and hopefully start a conversation in view of a future expansion. Please note the qualifications and excuses in the opening paragraph of the talk. Calling my approach "impressionistic" still strikes me as right, even though I believe that each point could be defended at much greater length with reference to specific texts. 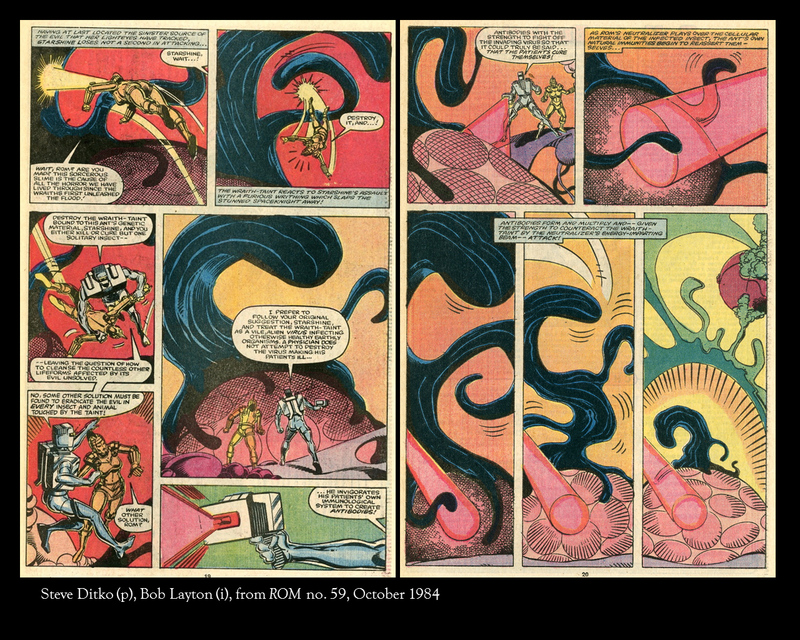 That being the case, please try to read the essay"poetically" if nothing else, listening for the--possibly only metaphorical--parallel between science and the comics genre to which this blog is devoted. One more thing: a full bibliography would be longer, but here were the main books that were on my desk as I wrote this, and from which I scanned all the images below that come neither from comics nor from Google Earth: Ian Stewart, Does God Play Dice: The Mathematics of Chaos,1990; Ian Stewart and Martin Golubitsky, Fearful Symmetry: Is God a Geometer?, 1992; James Gleick, Chaos: Making a New Science, 1987; Ilya Prigogine and Isabelle Stengers, Order out of Chaos: Man's New Dialogue with Nature, 1984; Hermann Weyl, Symmetry, 1952; Ludwig von Betalanffy, General Systems Theory, 1969; Andrew Hodges, Alan Turing: The Enigma, 1983; Edward N. Lorenz, The Essence of Chaos, 1995. When I gave Randy and Matt the topic for this talk, I did not realize that, in researching it, it would become quite as complex as it since has. In order to fulfill the promise of the abstract, I fear, this talk would need to be twice as long. However, only to treat a small part of it might not convey the full significance of the issue. Therefore this talk will end up being less detailed than I would have liked it to be. It deals with a number of related notions connected to the scientific—physical or chemical, and even sociological—concept of “system”; yet I will need to treat these subjects rather impressionistically. For example, when using a notion such as that of vector field, I will not have the time to give the specific mathematical definition of it, but I trust that the notion of a--in our case--two dimensional field structured by directional vectors should be at least intuitively clear. It is appropriate that I am discussing this subject here in Southern California. I first began to consider it in the Spring of 2008 when I found myself flying repeatedly from my home in Indiana to Los Angeles. 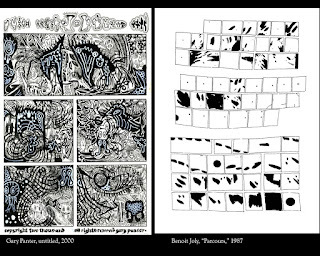 At the time I was in the process of putting together my anthology, Abstract Comics, and therefore I had on my mind a number of configurations of how comics function abstractly--non-representationally and non-narratively--as for example in these, two of my favorite examples from the book, the work of Gary Panter and Benoit Joly. At the same time I was working on my own comics; as a matter of fact, I had recently completed a series titled “24 x 24: A Vague Epic,” of which these are two pages. New artistic forms introduce new ways of aesthetic perception into the world. We then can apply these new ways to the appreciation of things outside of the strict artistic realm, which then become accidental artworks, in a sense. 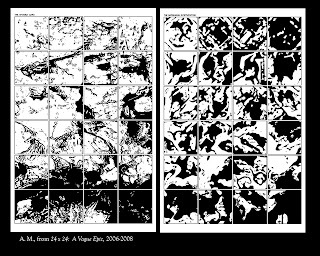 Of course, as I was thinking not simply of abstract painting, but of abstract comics at the time, I found myself noticing rectangular suburban subdivisions or farming plots dedicated to different crops, and realizing to what extent they seemed to be structured in patterns very much like a comic. I didn’t have a camera on me, so later I found myself going on Google Earth to find some of the same configurations. Of course, I wasn’t able to find the exact same parcels of land, but here is an example, from about where I first had this thought, under what I guessed was my flight path into LA. 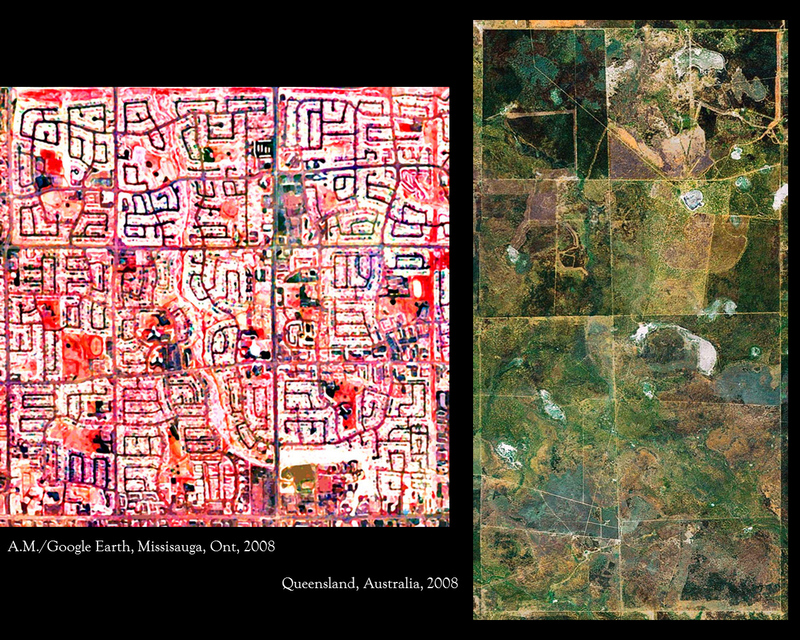 You can see a structured field, and what, in this context, may look like panels and panels within panels, the specific texture and color of which is defined by the respective composition of the soil and the cultivated crop, the habitation, the presence or absence of larger vegetation such as trees; while the panel structure itself is imposed by the man-made network of roads and paths and real-estate lots. It’s a formality of structure, which obviously is not intentionally sequential, but which strangely has some of the same systematic arrangement as rectangular panels within the larger rectangle of a comic page. 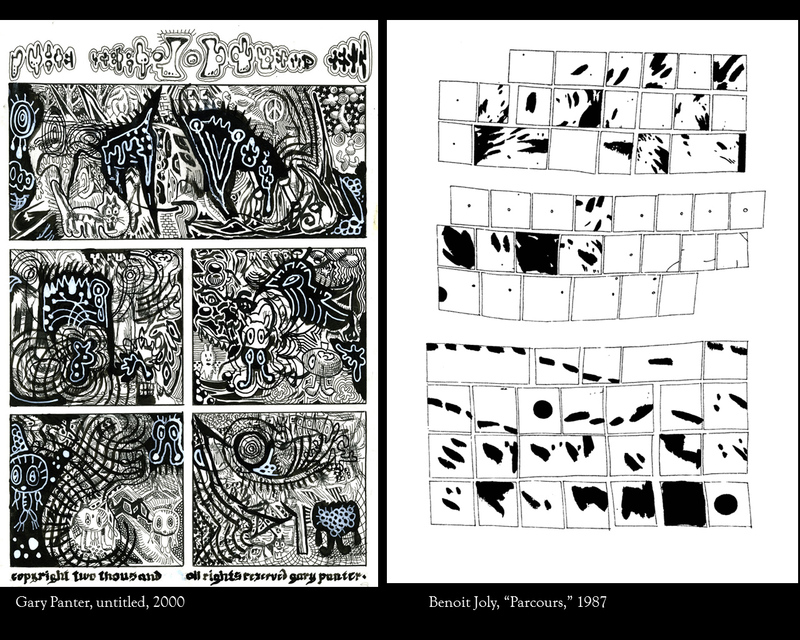 That summer I found myself doing this repeatedly, and coming up with a short series of “found art” which I called “The World is An Abstract Comic.” Here are two more examples. On the left you see a portion of Mississauga, Ontario, re-colored but with its original structure left intact; you can see not only an arrangement into “panels,” but even a larger, winding avenue—connecting neighborhoods to each other, cutting through the planned grid—that provides us with a parallel to the familiar trajectory of comics reading, from top right to bottom left. 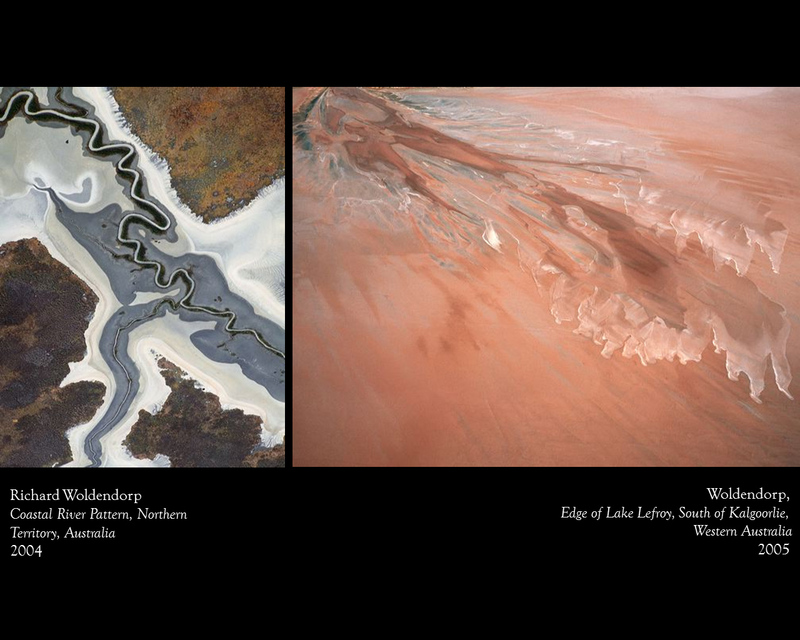 On the right, a portion of Queensland, Australia, which, if you look at it aesthetically, so to speak, seems to have the subtle tones and pictorial effects of a painted page by Bill Sienkiewicz or Dave McKean. 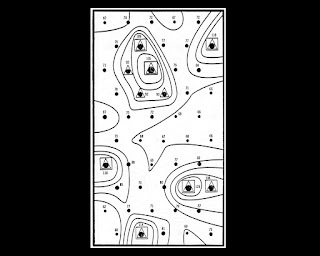 Symmetry-breaking is perhaps the most important process for pattern formation in the natural world, and it leads to increased complexity. 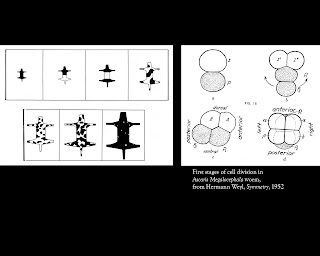 The notion, first seriously studied by Alan Turing in 1952, has been taken up by numerous disciplines recently, to the extent to which even cosmologists see the formation of the universe as the ultimate example of the creation of a complex system via the breaking of symmetry. 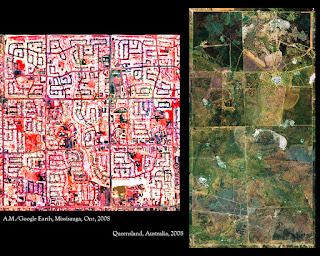 Returning back to earth, as it were, in our examples the modular sameness of the ideal grid gives way, differentiating the “panels” both in texture and also in structure, form, orientation; and the simple homogeneity of the pre-existing natural world is broken itself, inasmuch as differing crops are isolated from each other, in a kind of agricultural analogy to Maxwell’s demon. 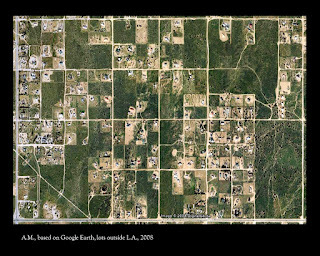 These aerial views, as I already mentioned, suggested to me an analogy to the basic functioning of a comic: to begin with, the grids of farm plots or city blocks visible in them are comparable to another idealized grid, the one that underlies our experience of any comic. I say idealized because the potential for the subdivision of the page into panels, and of the distribution of narrative moments across those panels, precedes any actual act of comic making, any specific choice of breakdown or layout. Furthermore, they pointed to the equally basic fact that, before you can have sequence, you need differentiation; in order to have a comic at all, the panels need to be different from each other. While this similarity--between the gridded earth surface and the panel grid--may seem accidental, keep in mind that, even in such plots of land, the structuring is due to a human activity of shaping and forming. In this structuring imposed by human action onto the natural world--world which, in its turn, proceeds to differentiate itself within the superimposed grid--we can begin noticing elements of cross-influence and formal conflict that lead to contrast between “panels,” to arising opposite vectors of force, etc. This structure is NOT fundamentally different from how a complex comic functions formally, and indeed, I would argue, it seems to be echoed in the structure, and process of structuring, of the abstract comics page--or of any comics page, in general. We also see power being centered in some areas which extend their influence over other localities, their population increasing while in other places the population stagnates or even decreases. 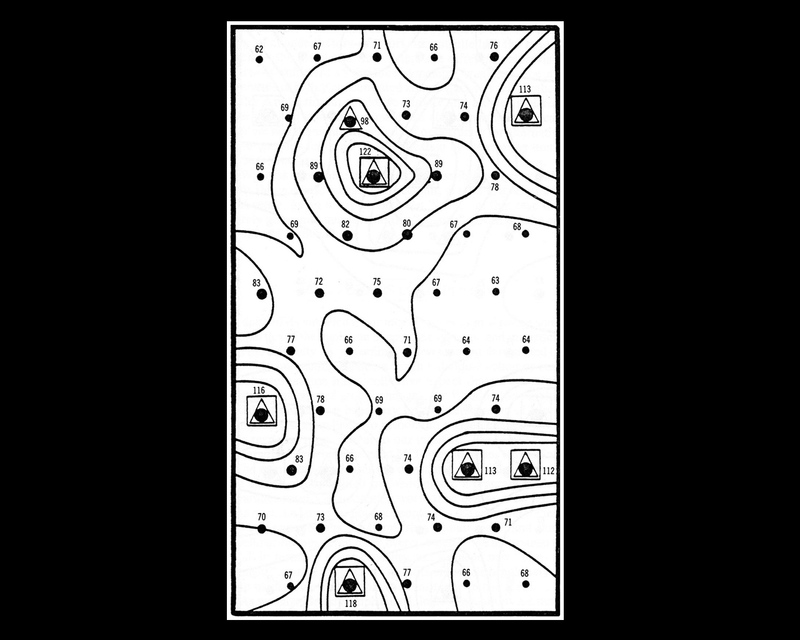 Of course it is a computer model, situated within an idealized, flat topography. Had it been applied to a real-world area, the final result would, on a much larger scale, have been similar to the Google-Earth based images I showed you earlier. 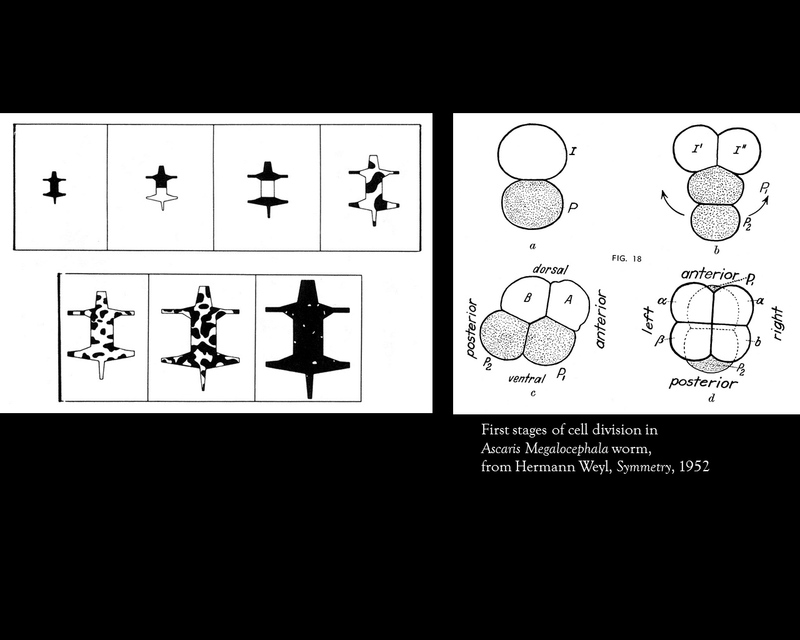 We see in this model transformation from a purely homogenous space to an articulated space through differentiation and symmetry breaking, and we can easily picture how any similar real-world areas came to be formed. Most importantly for us, Turing speculated that symmetry breaking occurs within a morphogenetic field—a preexisting “field” of information (in the case of the embryo, Turing speculated it was a varied chemical field) that helps translate genetic information to transform the homogenous embryonic blastula, or blob of cells, into an organism with front-back, left-right, and top-bottom differentiation. 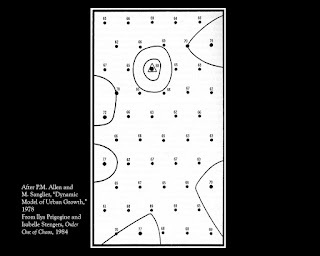 While biologists came to reject the notion of a chemical morphogenetic field in favor of a purely gene-based development (though it has recently been re-introduced by evolutionary biologist Rupert Sheldrake), Turing’s modeling has remained important for the study of any number of system developments. 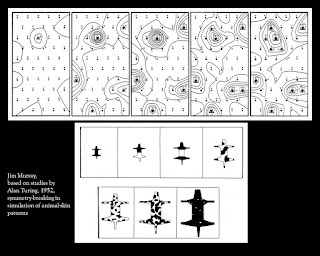 Looking back to the urbanization model, the development of it reveals the vectors of force inherent in the functioning of such a field: essentially, the grid of localities is charged by any number of economic, political, etc., forces and interactions, tensions which undermine the stability of the primordial grid and allow it to differentiate into complexity. 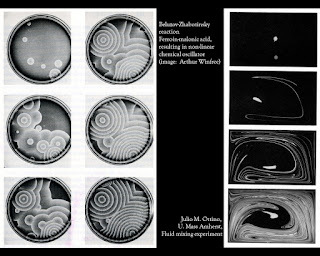 The variation from first to last stage, as seen here, shows how the differentiation process occurred, but the field itself is also plainly visible in the variation of forces, intensities, in the last stage itself. I hope you can see the same underlying field of tensions as having created any of the topography-based “found abstract comics” I showed you earlier. 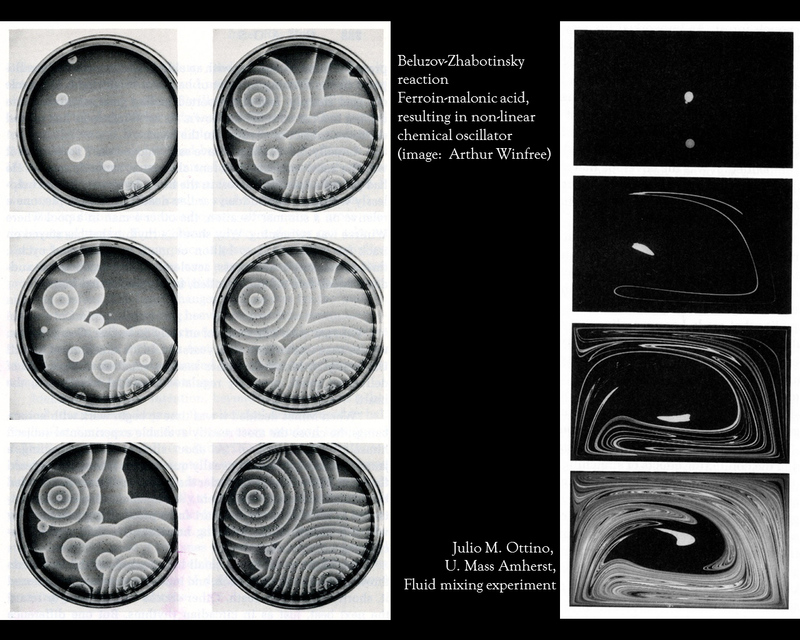 I would argue that it is by perceiving formally that underlying field of tensions, with its resultant forces and transformations, that we are led to appreciate aesthetically—with the aesthetics of an abstract comic, really—found artworks of this kind. 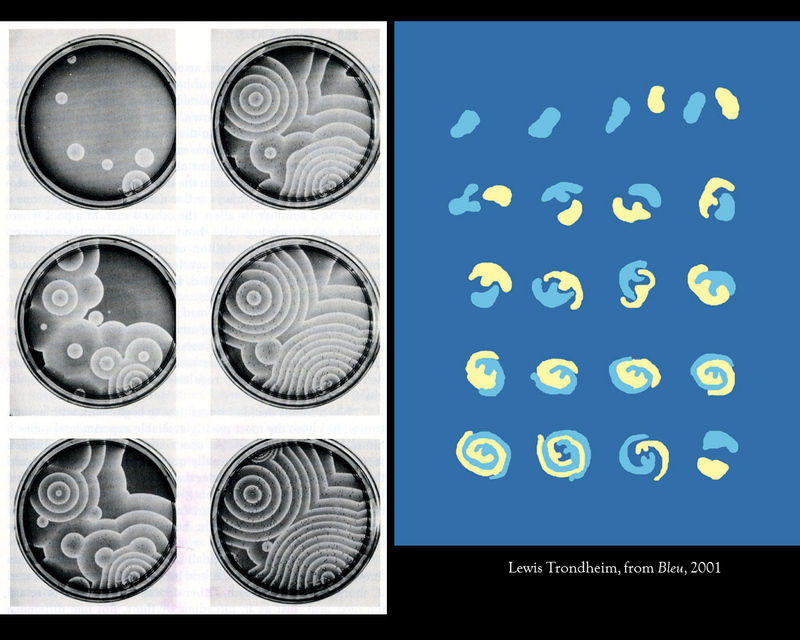 I know I’m running out of time so, for the sake of brevity, let me state my thesis succinctly at this point: abstract comics can model complex systems. 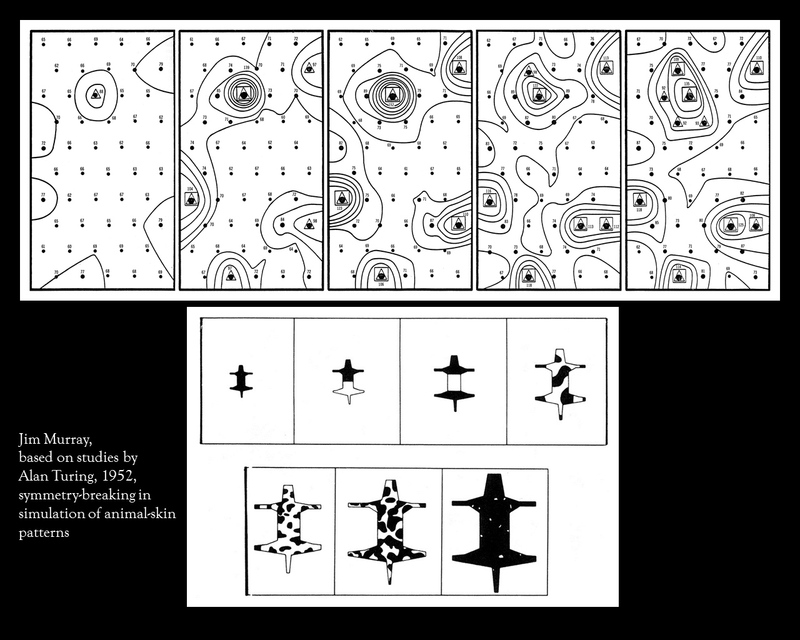 Within the idealized, pre-existing grid, the formation of a comic necessarily involves differentiation and symmetry breaking. And finally, this happens because any comic has a pre-existing morphogenetic field: that is, the potential panel grid, turned into a vector field by the presupposed top-to-bottom, left-to-right direction of reading, together with the differentiation expected between any two panels if sequentiality is to occur. 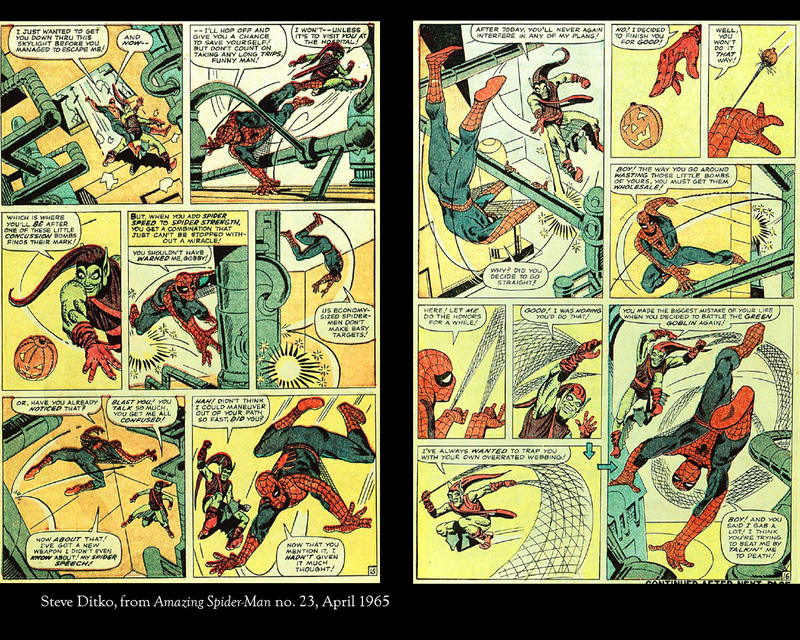 In ways which could be detailed at length, but which I only have the time to suggest here, these two pages reveal as nakedly as possible the morphogenetic field of comics, the simple pre-existence of a homogenous conceptual grid and its presupposed vectors of forces–and the potential for such a vector field, through differentiation and symmetry breaking, to provide rich and unexpected sequential art experiences. This effect yields perhaps the highest kind of aesthetic satisfaction in comics, and it does so by largely bypassing any logic of literary illustration. Rather, it turns itself into an abstract model of system-formation, laying visible a complexity that transcends simple narrativity. 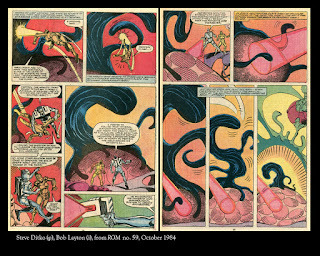 Abstract comics have learned this lesson and done away with that narrativity altogether, but they could do so only by finding examples to follow in the work of masters such as Ditko. I don't see any obvious flaws in your theory. It seems to me that you worked it out with great care and yet made an effortless presentation. I really admire this. I have a habit of always trying to push ideas in the direction of the ultimate, and it's because of this habit that I came away with questions. I can't judge if the questions have general interest or not. 1. Is aesthetic achievement in comics an end in itself? The other behaviors, such as the planting of fields for cultivation, the development of urban or suburban subdivisions, the carving of canyons that rivers do, even the development of a fetus, don't strike me as ends in themselves. So in this sense, perhaps comics are of a different kind or category than these examples. Or perhaps aesthetic achievement is also a means to an end. I am on the fence about this, as well as the value of one over the other. Plus I say "perhaps" because the ends/means differentiation may not possess decisive impact for you in the way it does for me. 2. Would your observations be true if there were no airplanes? I am amazed at how our technological advances reveal the world to us. The observatory which made Hubble's notes possible is forgotten when we consider the epic impact of his findings, but without its eyes on the sky, Hubble would not have seen what he saw. The subsequent pace of invention, the way we are able to extend our lousy vision to see and learn, is dizzying to be sure, but all so very, very recent. I doubt that we understand our role in learning about the cosmos, and I think we'll need centuries yet before we do. If you were limited to ground level observations, would there be a truth about systems that would lie hidden and unknown, awaiting discovery? Or do our observations from the sky create the sense of symmetry-breaking and differentiation? The question is probably academic, I know. Thank you for a fulfilling read! Please note that anonymous comments will be rejected. 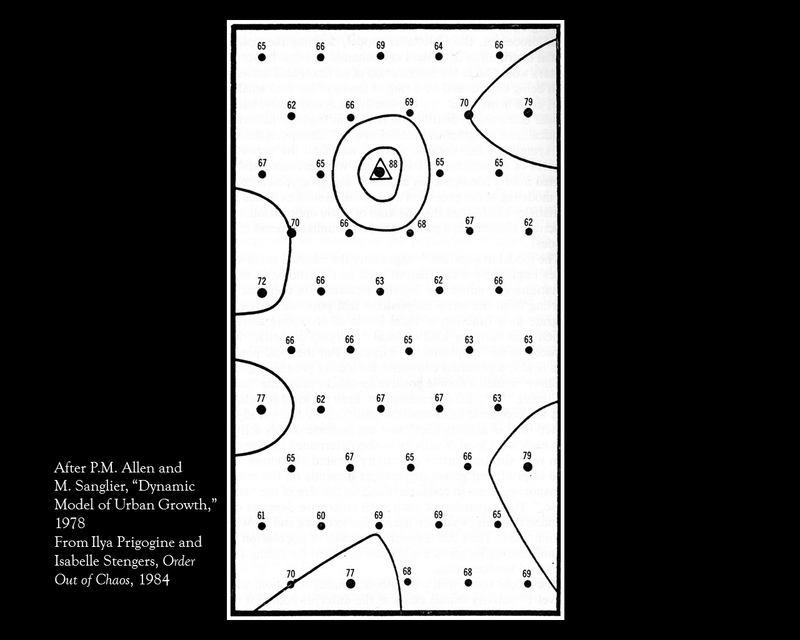 À M (une vie de François Morellet).